Tomorrow, 9 April 2019, the trial of Jennifer W, a 27-year-old German citizen, will begin in the Higher Regional Court of Munich. The defendant has been charged with membership of a foreign terrorist organisation (ISIS), murder, murder as a war crime and violations of the German War Weapons Control Act. If convicted, she faces a maximum sentence of life imprisonment. According to the indictment, the defendant left Germany in August 2014 and joined the command structure of ISIS in Iraq shortly thereafter. She is alleged to have been an active member of ISIS’ “morality police” (hisbah), responsible for enforcing ISIS’ strict rules on dress code, public behaviour and alcohol and tobacco consumption. She allegedly patrolled parks and public spaces in Fallujah and Mosul carrying weapons including a Kalashnikov assault rifle, a pistol and an explosive vest and dispensing punishment for violations of ISIS’ “moral code”. In the summer of 2015, the defendant and her husband “purchased” and enslaved a 5-year-old Yazidi girl who was part of a group of prisoners of war. They held the child and her mother as captives at their residence in Fallujah. At that residence, the child was chained outdoors as a punishment and murdered by being left to die in scorching temperatures. Amal Clooney, a barrister at Doughty Street Chambers, and German attorneys Natalie von Wistinghausen and Wolfgang Bendler represent the girl’s mother as her counsel in the proceedings. Information provided by their client indicates that the defendant engaged not only in murder as a war crime, but also in crimes against humanity, including murder, human trafficking, torture and deprivation of physical liberty. This case is believed to be the first prosecution anywhere in the world for international crimes committed by ISIS militants against Yazidi victims. 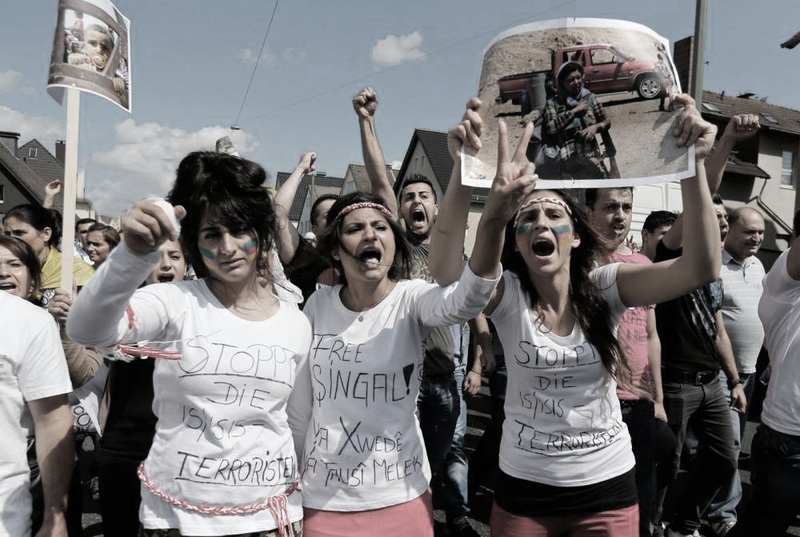 From August 2014, the Yazidi community in Iraq and Syria was targeted by ISIS through an organised campaign of executions, enslavement, sexual violence, and forced recruitment of child soldiers, as well as the forcible displacement of an estimated 400,000 Yazidis from their homeland in Iraq. These crimes have been recognised by the United Nations, the German Federal Court of Justice, and other national and international bodies as amounting to genocide. According to Nobel Peace Prize Laureate Nadia Murad, herself a survivor of enslavement and torture at the hands of ISIS militants, “this case is important for all Yazidi survivors. Every survivor I have met and spoken to is waiting for the same thing – for the perpetrators to be prosecuted for their crimes against Yazidis, including women and children. So this is a very big moment for me, and for the entire Yazidi community”. According to Haider Elias, President of Yazda, a global Yazidi NGO whose documentation work in Iraq since 2015 was instrumental to this prosecution and the identification of the girl’s mother: “Our continuous commitment to the Yazidi community is finally paying off. This is a big first step of what we hope becomes a groundbreaking trial that will encourage other countries to prosecute their nationals. We would like to thank Germany and our legal team for their hard work. But we also believe more needs to be done to address the suffering of the Yazidis, especially women and children, and we ask that the thousands of ISIS fighters currently in detention also be held to account for their crimes”. According to victim’s counsel Amal Clooney: “Yazidi victims of genocide have waited far too long for their day in court. I am grateful to the German prosecutors who I have worked with for their commitment to holding ISIS members accountable for their crimes. And I hope that this will be the first of many trials that will finally bring ISIS to justice in line with international law”. According to victim’s counsel Natalie von Wistinghausen: “It is an important task to ensure that the rights and the interests of our client are fully respected during the entire proceedings, consistent with all fair trial guarantees. Our client wants justice to be done, as well as the opportunity to give a full account of the suffering she and her daughter lived through”. According to victim’s counsel Wolfgang Bendler: “The victim's counsel will ensure that, through this trial, the accused will be shown the full extent of the impact of her alleged crimes. We reject any attempt to instrumentalise this case as a politically or religiously motivated trial, as suggested in recent statements by supporters of ISIS, and of the defendant”. Under German law, murder is a crime under the German Criminal Code and murder as a war crime is a crime under the Code of Crimes against International Law. German law provides that victims of such grave crimes have rights as ‘private accessory prosecutors’ and can participate fully in the proceedings alongside the prosecution and defence. غدًا ، 9 أبريل 2019 ، ستبدأ محاكمة جنيفر دبليو ، وهي مواطنة ألمانية تبلغ من العمر 27 عامًا ، في المحكمة الإقليمية العليا بمدينة ميونيخ. تم اتهام المدعية عليها بالانتماء إلى منظمة إرهابية أجنبية ( داعش) بتهمة القتل كجريمة حرب وانتهاكات لقانون مراقبة أسلحة الحرب الألمانية. إذا ما تمت ألادانة ، فإن المدعية عليها ستواجه عقوبة السجن المؤبد. وفقًا لعريضة الاتهام ، غادرت المتهمة ألمانيا في أغسطس 2014 وانضمت إلى هيكل قيادة داعش في العراق بعد ذلك بوقت قصير. يُزعم أنها كانت عضوًا نشطًا في "شرطة الأخلاق" التابعة لداعش (الحسبة) ، المسؤولة عن تطبيق قواعد داعش الصارمة بخصوص قواعد اللبس والسلوك العام واستهلاك الكحول والتبغ. وزُعم أنها كانت تقوم بدوريات في الحدائق العامة والأماكن العامة في الفلوجة والموصل وهي تحمل أسلحة بما في ذلك بندقية هجومية من طراز كلاشينكوف ومسدس وسترة ناسفة وتفرض عقوبة على انتهاكات "القانون الأخلاقي" لداعش. في صيف عام 2015 ، "اشترى" المدعية عليها وزوجها واستعبدوا فتاة يزيدية تبلغ من العمر 5 سنوات وكانت جزءًا من مجموعة من أسرى الحرب. احتجزوا الطفلة ووالدتها في الأسر في الفلوجة. في ذلك السكن ، تم تقييد الطفل بالسلاسل في الهواء الطلق كعقاب وقتل من خلال تركه ليموت في درجات حرارة الشديدة. بحسب نادية مراد الحائزة على جائزة نوبل للسلام ، وهي نفسها من الناجين من الاستعباد والتعذيب على أيدي مقاتلي داعش ، "هذه القضية مهمة لجميع الناجيات من الايزيديين. كل ناجٍ قابلتُها وتحدثت معهت تنتظر نفس الشيء - لمقاضاة الجناة على جرائمهم ضد الايزيديين ، بمن فيهم النساء والأطفال. هذه لحظة كبيرة جدًا بالنسبة لي ولمجتمع الايزيدي بأكمله ". وفقًا لحيدر إلياس ، رئيس منظمة يزدا، وهي منظمة غير حكومية عالمية ايزيدية تعمل على توثيق الابادة في العراق منذ عام 2015 ولها دورًا أساسيًا في هذه الملاحقة وتحديد هوية والدة الفتاة: "إن التزامنا المستمر بالمجتمع الايزيدي يؤتي ثماره أخيرًا". هذه خطوة أولى كبيرة مما نأمل أن تصبح تجربة رائدة تشجع الدول الأخرى على محاكمة مواطنيها. نود أن نشكر ألمانيا وفريقنا القانوني على عملهم الشاق. لكننا نؤمن أيضًا بأنه يجب القيام بالمزيد من الجهود لمعالجة معاناة الايزيديين ، وخاصة النساء والأطفال ، ونطلب أن يتم محاسبة الآلاف من مقاتلي داعش المحتجزين حاليًا على جرائمهم ". ووفقًا لمحامي الضحية أمل كلوني: "لقد انتظر ضحايا الإبادة الجماعية الايزيدية وقتًا طويلاً للغاية ليومهم في المحكمة. أنا ممتنة للمدعين العامين الألمان الذين عملت معهم لالتزامهم بمحاسبة أعضاء داعش على جرائمهم. وآمل أن تكون هذه هي الأولى من بين العديد من المحاكمات التي ستقدم في النهاية داعش إلى العدالة بما يتماشى مع القانون الدولي ". وفقًا لمحامي الضحية ناتالي فون فيستهاوزن: "من المهم ضمان احترام حقوق ومصالح عملائنا بالكامل خلال الإجراءات بالكامل ، بما يتوافق مع جميع ضمانات المحاكمة العادلة. يريد عملاؤنا تحقيق العدالة ، وكذلك الفرصة لتقديم وصف كامل للمعاناة التي عانت منها الضحية هي وابنتها ". وفقًا لمحامي الضحية فولفغانغ بندلر: "سوف يضمن محامي الضحية ، من خلال هذه المحاكمة ، أن تُظهر للمتهم المدى الكامل لتأثير جرائمها المزعومة. نحن نرفض أي محاولة للاستفادة من هذه القضية باعتبارها محاكمة ذات دوافع سياسية أو دينية ، على النحو المقترح في التصريحات الأخيرة من قبل أنصار داعش ، والمدعية عليها ". “The draft Law applies to Yazidi women who were kidnapped and enslaved by ISIS, and later escaped or were rescued from captivity. It aims to award financial and ethical compensation to these female survivors, to rebuild their lives and their towns, to facilitate their full rehabilitation, reintegration into society, to enable them to live in dignity and prosperity. On March 26th, Nadia Murad took part in the Stand, Speak, Rise Up conference – a platform for survivors and key actors to come together to end sexual violence in fragile environments. The event took place in Luxembourg, as part of an initiative of the Grand Duchess of Luxembourg. At the event, Murad spoke about the need for justice and accountability for Yazidi survivors of sexual violence. “Justice is the cure for sexual violence,” Murad stated. During her time in Luxembourg, Murad also met with the Foreign Minister and Prime Minister of Luxembourg to further discuss the importance of seeking justice and accountability for Yazidi survivors. في ٢٦ آذار/ مارس، شاركت ناديا مراد، الحائزة على جائزة نوبل للسلام، وسفيرة النوايا الحسنة لدى مكتب الامم المتحدة المعني بالجريمة والمخدرات، ورئيسة "مبادرة ناديا" في مؤتمر خاص خاص بالضحايا والناجيين والعنف الجنسي في البيئات الهشة التي تعاني من الصراعات. Nadia’s Initiative is working with local Yazidi NGO, Eyzidi Organization for Documentation, to begin repairing the Sinuni Hospital supplement. Sinuni is the main city north of Sinjar Mountain in Northern Iraq. Parts of the hospital were destroyed and looted during ISIS attacks in the region. With the support of Nadia’s Initiative, the Eyzidi Organization for Documentation is repairing the hospital, fitting it with new doors, windows, floor tiles, plaster, and paint. Nadia’s Initiative is also working to build a new hospital in Sinjar, the main city south of Sinjar Mountain. With funds from the French government, Nadia’s Initiative plans to work with implementing partner and French NGO, Chaine de l’Espoir (CDE), to build a new hospital over the next three years. Currently, the Iraqi government is assigning a plot of land for the new construction. In an effort to respond to medical needs in the interim period, CDE and Nadia’s Initiative are building an Operating Theater in the wing of the current hospital building. مبادرة ناديا تعمل مع المنظمة الايزيدية للتوثيق وهي منظمة محلية غير حكومية، على ترميم، إعادة تأهيل ملحق مستشفى سنونى العام، شمال جبل سنجار، أجزاء من هذه المستشفى تم تدميرها بواسطة داعش وتم نهب وسرقة كافة ممتلكاتها اثناء سيطرة داعش على هـذه المنطقة. بدعم وتمويل من مبادرة ناديا، منظمة الايزيدية للتوثيق تقوم بإعادة ترميم ملحق المستشفى وتزوده بالأبواب والشبابيك الجديدة مع إعادة ترميم الأرضية وصبغ الجدران، تجهيزه بالأثاث. تعمل " مبادرة ناديا" ايضا على بناء مستشفى جديدة في سنجار، المدينة الرئيسيّة التي تقع جنوبي جبل سنجار.، بتمويل من الحكومة الفرنسية، مبادرة ناديا تسعى ايضا الى بناء مستشفى جديدة متطورة بالشراكة مع منظمة (CDE ) الفرنسية كجهة منفذة خلال الثلاث سنوات المقبلة، بعد ان تم تخصيص قطعة ارض لبنائها من قبل الحكومة العراقية، وذلك لتلبية الاحتياجات الصحية لأهالي المنطقة. “Human rights advocates met Tuesday in Paris to discuss potential strategies leading industrial nations could employ to reduce violence and discrimination against women. French President Emmanuel Macron named 35 advocates to give the Group of Seven recommendations, France took over the G-7's presidency on Jan. 1, and Macron has said he wants gender equality to be a main focus. The advocates are addressing three main topics: combating violence against women, promoting girls' education and women's entrepreneurship. Ambassador Kao stated that the $500,000 donation will be used to support “Nadia’s Initiative”, an international NGO dedicated to assisting the Yazidi people of Iraq that suffered genocide and religious persecution at the hands of ISIS. 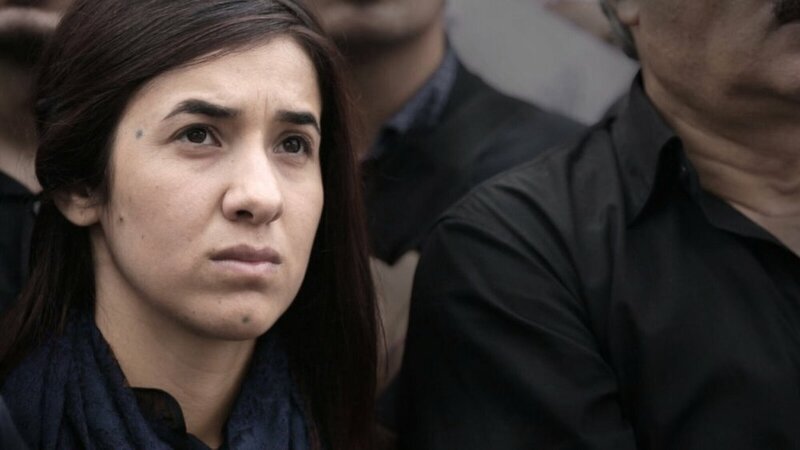 The founder of the organization and 2018 Nobel Peace Prize Laureate, Nadia Murad, is a leading advocate for fellow survivors of genocide and sexual violence. Nadia’s Initiative has received international recognition and support from the United States, France, the United Kingdom, the United Nations, and others. During the Ministerial, Ms. Murad was honored by U.S. Secretary of State, Mike Pompeo, and personally conveyed her appreciation towards Taiwan’s contribution to Ambassador Kao. Both Iraq and its autonomous Kurdish region have formed new governments that seem ready to resume talks about the status of Iraq’s disputed territories. These are fourteen administrative districts – of which Sinjar is one – nominally controlled by Baghdad but claimed by the Kurdish regional government in Erbil. A new UN special representative for Iraq has brought fresh momentum to the task of resolving the disputed territories’ status. Meanwhile, Nadia Murad, a UN Good-will Ambassador who survived the Yazidi genocide, has won the Nobel Peace Prize, attracting renewed international attention to Sinjar in particular. The new government and the UN should jump at this chance to work with Yazidi leaders to rebuild Sinjar as an example for all Iraq. "Sexual violence as a weapon of war is not isolated to one conflict — it is a common tactic used around the world. Reparations are a step toward restoring dignity to survivors who often do not have any means to seek justice for the pain and suffering they have endured. A global fund is an innovative solution to providing survivors with a path towards healing and it signals that our collective conscience acts in the name of humanity. The international community must push politics aside and prioritize justice and humanity." The Act is intended to provide the ultimate response to the genocidal atrocities committed by Daesh in Syria and Iraq, “to provide emergency relief to victims of genocide, crimes against humanity and war crimes in Iraq and Syria, to provide accountability for perpetrators of these crimes and for other purposes.” Read more in Forbes. “ Mr. President, there is much to be optimistic about in Iraq today. We see Iraq’s future in Nadia Murad, whose foundation Nadia’s Initiative is dedicated to helping women and children victimized by genocide, mass atrocities, and human trafficking. Through her efforts, Nadia has helped hundreds of Iraqi women and children heal and rebuild their lives and has set an example to many Iraqis who are following her lead. She has had an immeasurable impact on the global conversation to end the use of sexual violence as a weapon of war. The United States congratulates her on being awarded the 2018 Nobel Peace Prize. SINJAR, Iraq—Iraq’s strategically located town of Sinjar, now empty of civilians and devoid of life, “lies buried beneath rubble. Although it was liberated from the Islamic State three years ago, the city remains in ruins—and has become rife with proxy militias vying for regional control. Situated about 20 miles from the Syrian border, the town lies south of the Sinjar Mountains, a range that has always held geographic importance. Former Iraqi dictator Saddam Hussein reportedly used the mountains, which have a high point of 4,800 feet, to launch missiles into Israel during the Gulf War in the 1990s.” Read more in Foreign Policy.